Raymond Durgnat's classic study of British films from the 1940s to the 1960s, first published in 1970, remains one of the most important books ever written on British cinema. In his introduction, Kevin Gough-Yates writes: 'Even now, it astounds by its courage and its audacity; if you think you have an 'original' approach to a film or a director's work and check it against A Mirror for England, you generally discover that Raymond Durgnat had said it already.' Durgnat himself said about the book that 'the main point was arranging a kind of rendezvous between thinking about movies and thinking, not so much about sociology, as about the experiences that people are having all the time.' Durgnat used Mirror to assert the validity of British cinema against its dismissal by the critics of Cahiers du cinéma and Sight and Sound. His analysis takes in classics such as In Which We Serve (1942), A Matter of Life and Death (1946) and The Blue Lamp (1949), alongside 'B' films and popular genres such as Hammer horror. Durgnat makes a cogent and compelling case for the success of British films in reflecting British predicaments, moods and myths, at the same time as providing some disturbing new insights into a national character by whose enigmas and contradictions we continue to be perplexed and fascinated. 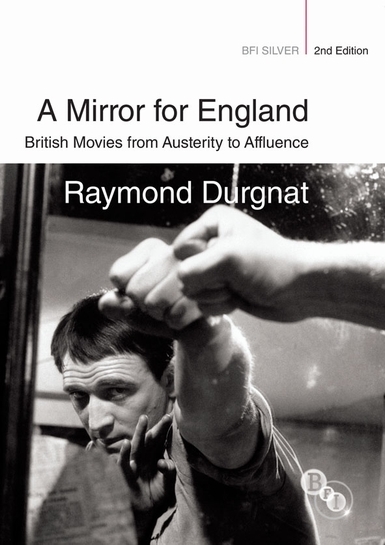 Raymond Durgnat's classic study of British films from the 1940s to the 1960s, first published in 1970, remains one of the most important books ever written on British cinema. In his introduction, Kevin Gough-Yates writes: 'Even now, it astounds by its courage and its audacity; if you think you have an 'original' approach to a film or a director's work and check it against A Mirror for England, you generally discover that Raymond Durgnat had said it already.' Durgnat himself said about the book that 'the main point was arranging a kind of rendezvous between thinking about movies and thinking, not so much about sociology, as about the experiences that people are having all the time.' Durgnat used Mirror to assert the validity of British cinema against its dismissal by the critics of Cahiers du cinéma and Sight and Sound. His analysis takes in classics such as In Which We Serve (1942), A Matter of Life and Death (1946) and The Blue Lamp (1949), alongside 'B' films and popular genres such as Hammer horror. Durgnat makes a cogent and compelling case for the success of British films in reflecting British predicaments, moods and myths, at the same time as providing some disturbing new insights into a national character by whose enigmas and contradictions we continue to be perplexed and fascinated.